The Income Summary is one of the financial dashboard (s) which are included out of the box with CleverQ. Default Date Range is set for a rolling 12 month year. 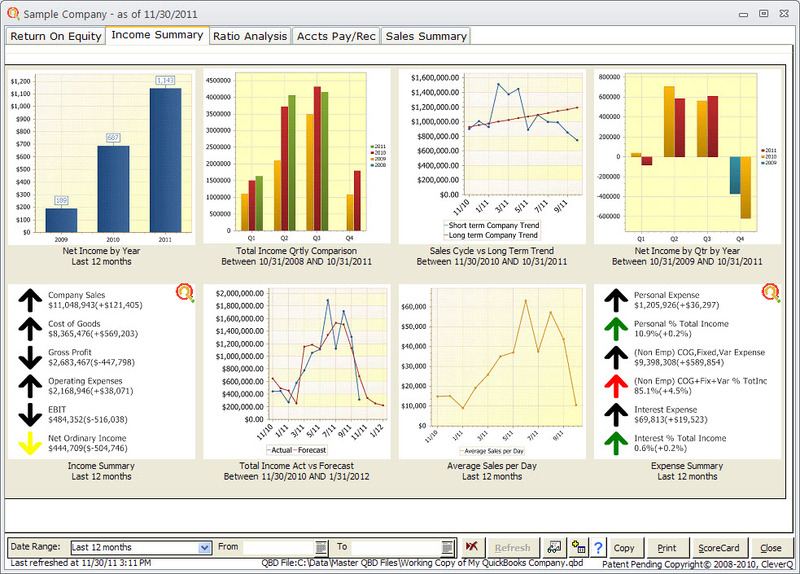 All Dashboards, Gauges, can be customized by your company's CleverQ Administrator. Date Ranges can change by the end user and/or defaults can be changed by your CleverQ administrator. Total Income Quarterly Comparison to Previous Year Quarters. Long term Company Trend shows Annualized and Normalized Income with Seasonal Trends Removed compared to the Long term Company trend which is represented by the linear trend which is Annualized and Normalized with Seasonal Trends removed. Net Income by Quarter compared to Previous Year Quarters. Actual Income Graph with forecasting Income using a proprietary logarithm adjusted for seasonal trends.